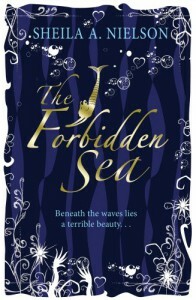 Call me crazy, but maybe I was completely off base in thinking that a book titled "Forbidden Sea" would actually be about the sea.Unfortunately, there were only a few actual pages in this whole entire story that involved either the sea or mermaids, which was the biggest reason for me picking up the book to begin with.I really wanted a book to get away from the mass amounts of paranormals that I had been reading lately involving vamps, shifters, magic users, etc. So the notion struck me, "let's find some books about mermaids, sirens, or maybe even selkies - something different for a change. "Yeah, well...so much for that idea. Don't get me wrong. This book was alright. The first half didn't really grab me, but it had its moments. If nothing else, the story slowly evolved into a cute emulation of a fairy tale. It never hurts for the overlooked heroine to finally catch the eye of the guy that she's pining for.3 stars because the story wasn't bad, but I find myself having a harder time going any higher because nothing felt new or fresh to me.